THE evening of September 19 will stay in the minds of four surf lifesavers for many years to come. It was nightfall at Elliot Heads when a distress beacon alerted staff at the Driftwood Cafe to a tourist stuck on the island. The staff took the details of the emergency - it seemed as though four tourists had walked over to the island at low tide, they lost track of time and didn't realise how quickly the ocean came in. The cafe staff alerted Bundaberg SLSC's Jamie Findlay, who liaised with two members of the Elliott Heads SLSC, Donna Wall and Jason Wall, who were staying at the caravan park. They set up the IRB while Mr Findlay called fellow Bundaberg SLSC volunteer Riley McGregor to help with the rescue effort. They were working against the clock as the sun set on the spring afternoon. When Mr Findlay and Mr McGregor arrived at Elliott Heads, the IRB was set and ready to go. They proceeded to Dr May's Island and saved two female patients, before returning to retrieve the two male patients in pitch black using only a head lamp as light. The bravery which took place on the night has now been recognised at Parliament House. Federal Member for Hinkler Keith Pitt presented Mr Findlay and Mr McGregor with the National Rescue of the Month award. 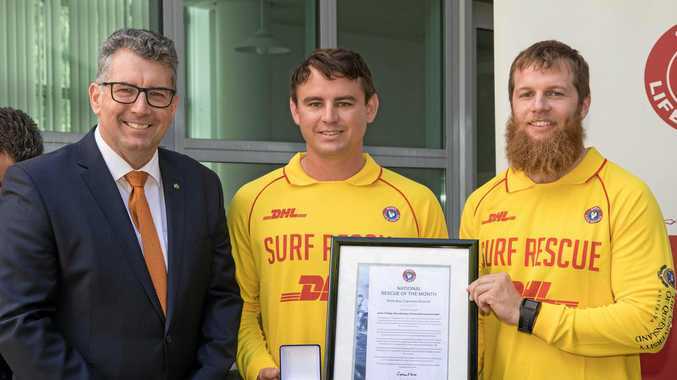 Mr Findlay spoke with the NewsMail, saying it was a great opportunity to attend the SLSA National Rescue of the Month awards to recognise the efforts of all the volunteer lifesavers. He said they proved they were always on call and ready to assist when and where needed. "It was also a truly humbling experience. To us, what we did was by no means extraordinary in our eyes, but it meant that four tourists got to go home that night and sleep in their beds,” he said. "It was great to hear the stories of other awardees from different months, we were in awe of their efforts from clubs all around Australia.